there is a comfort in being anonymous, unknown, undetected, pouring into the world unhindered by expectations. often, this is my reason for traveling alone to destinations unmarked on the maps of the multitudes of unimaginative tourists, who are herded by the ideas of tired travel guides and follow patterns of migration suggested by generally helpful but unoriginal travel bloggers. i find serenity in my imagined solitude: knowing that i can be anyone i want to be where no one knows who i am, i find a joyous peace in being myself. this, however, was not the case for kalibo during the ati-atihan festival, where i pranced around like a crazy cow on the crowded streets of aklan's capital and i vaguely heard my name called from somewhere up above. no, i was not being scolded by the heavens for my irreverent, if not uncoordinated, dancing, but was spotted by friends from law school perched on the fourth floor terrace of a nearby building. but then again, stranger or no, unsyncopated movements, which are not unlike what you might expect from anyone suffering a seizure or trampling on a horde of cockroaches, seemed to be the order of the day. tribes in their costumes ranging from buckets of soot to pails of paint, colorful armors adorned with shells, broken glass, and brooms, and armies of bands schooled in the conservatories of the streets, marched around pastrana park in honor of the tradition of the feast of the christ child. in these parts, however, the purpose of the festival seems to have been forgotten. irreverent and blasphemous, the festival is more pagan than it is catholic. 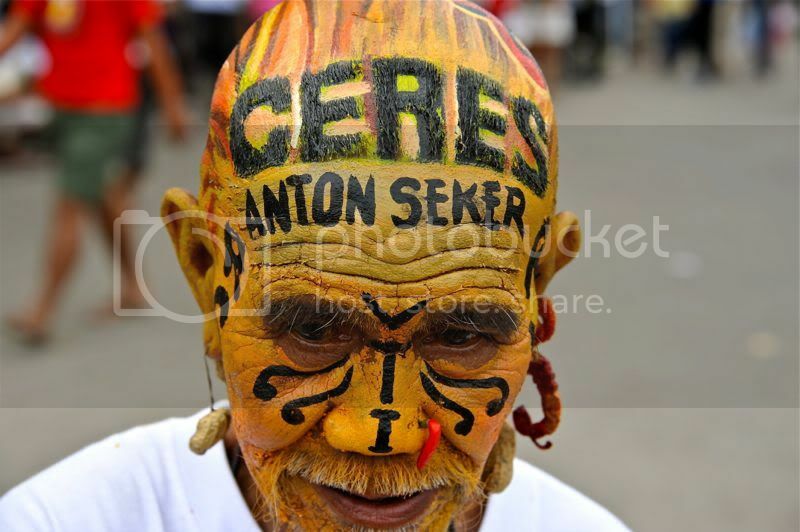 which is not such a bad thing, i think, because the festival is merely returning to its origin, centuries before the spaniards arrived and imposed their religion into the rituals celebrating the pacts between the native atis and the datus from borneo. i planned my return to kalibo to be another lonely journey. although there were expressions of interest from several of my friends who had stumbled upon my story of last year's interesting turn of events, i normally have a low tolerance for empty talk, so expected no one to join me, and that i would, as before, end up swallowed alone by the confusion that is the ati-atihan. in relative silence i booked my flights, inquired about accommodations, and fixed my itinerary, which involved exhausting commutes, but ultimately cheaper airfare. nevertheless, my plans to be alone were torn asunder by an email from more than 10,000 kilometers away. i was innocently asked by my slovenian friend andri what i had planned around january, and i very casually shared my ideas. a few days after that, andri said that he and two of his friends would be joining me, and that i should buy tickets for all of them. we all arrived in iloilo several hours delayed, and decided to take our own car to kalibo to save on time as well as spare us a night's stay there. 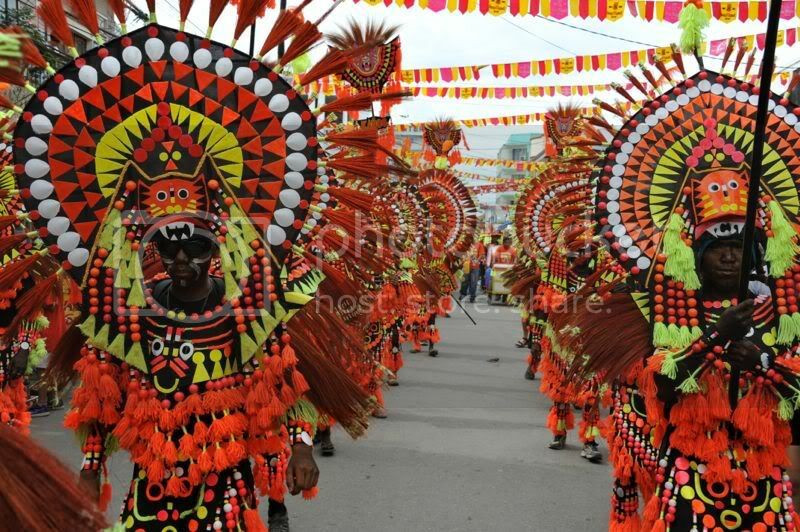 personally, i wanted to jump right into the ati-atihan. along the way, we were slowed down by intermittent rain, even as our vehicle passed trees with white-washed trunks that lined the highway. it was already past midnight when we arrived at our hostel, and our rooms weren't ready. so we left to check out magsaysay park, which was already possessed by the frenzy of fiesta. it appeared as though the crowd had doubled, and even at that late hour, a sea of people were jumping to the strained chords of a local band. initially, i thought that the organizers had pulled people from the audience to sing familiar songs. the singing reminded me of a very average evening at any generic karaoke bar, but no one seemed to care. my friends were particularly surprised at how they were treated: like celebrities. complete strangers approached us and asked to have pictures with them. the white glow of europe had apparently rubbed off on me because not a few people asked the same of me. we would return to magsaysay park for three nights, and always return to the hostel already in the small hours of the morning. our patterns were rather predictable: we woke up late, close to noon, and leave our room for lunch, walk around town to find makeshift tables on the streets, and hear the familiar sounds of clinking mugs or beer bottles bumped in midair. we walked around pastrana park to watch the festivities, occasionally stomping our feet and shaking our hips as separate bands drowned each other's versions of stylized nursery rhymes and sting's "englishman in new york" and repetitions of other songs rendered unfamiliar by the choice of instruments. 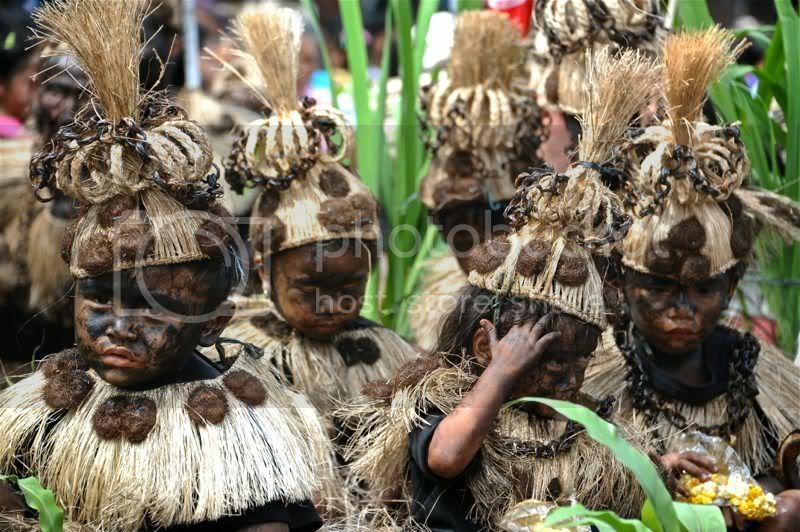 although there were "proper" tribes that paid homage to the christ child, there were flash-mob type groups that appeared from nearby street corners, towing incomplete bands, some of their percussionists banging on improvised drums. 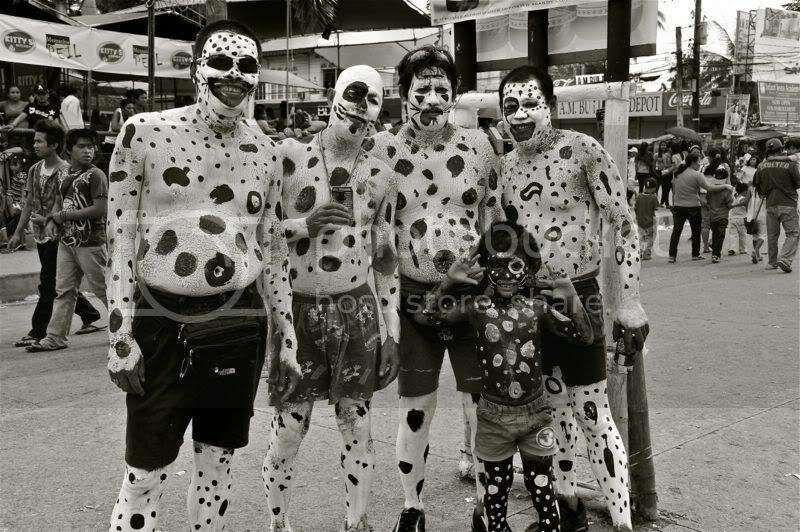 they buzzed around the town plaza in a variety of costumes: the animal kingdom seemed to be dominant this year as groups came out painted as snakes, lizards, zebras, dalmatians, butterflies, birds. 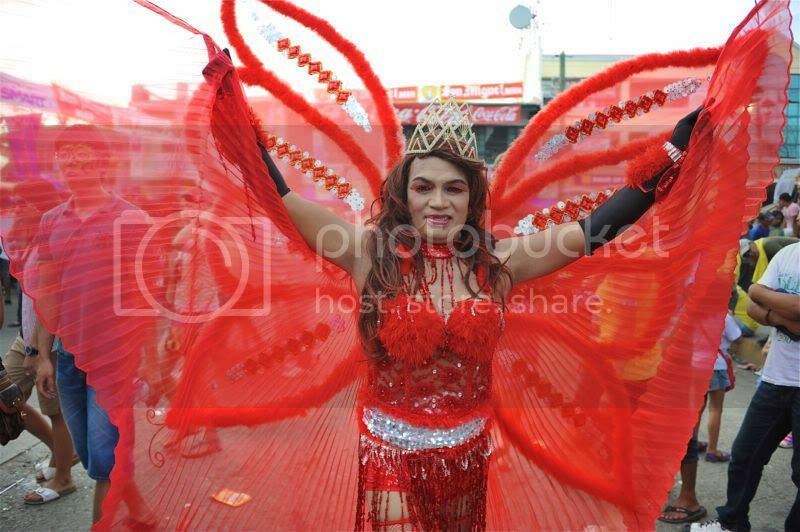 transvestites dolled up in flamboyant, flowing gowns with trains that bloomed like a peacock's tail, turned the littered streets of kalibo into their catwalks. some even courted heavenly punishment by carrying santo niños in various stages of undress. there was no order in the parade. in fact, there was no proper parade to speak of. the route prior to sunday's procession was not prescribed, and the groups wound around the main plaza with neither rhyme nor reason, often getting entwined in each other's trains. when this happened, revelers raised their bottles to each other while the musicians started beating on their drums and xylophones with greater force, and their interpretations of popular tunes became strange noises that could only be the sound of pure chaos. i wrapped my head around these tings and bangs and booms and shook with the deliberate grace of a madman. i knew i was out of sync, but it didn't seem to matter. when in kalibo for ati-atihan, you dance to the music playing in your head. 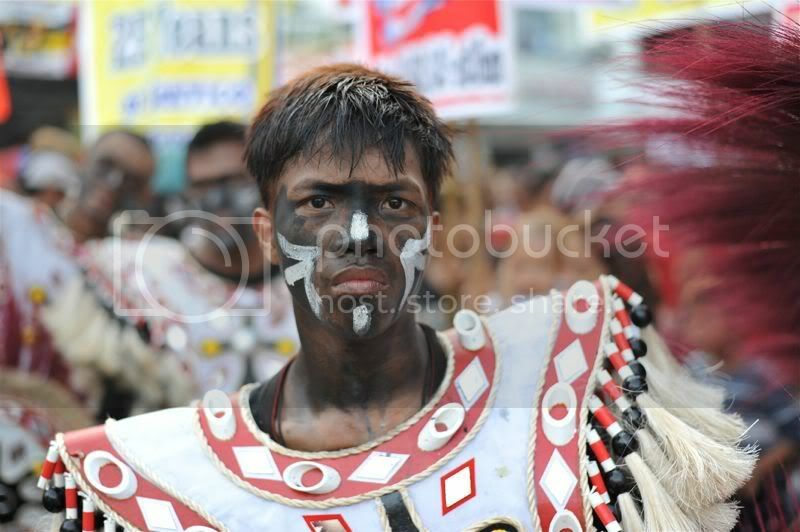 and it is this acceptance of whatever crazy idea you have that sets the ati-atihan apart from all other fiestas. 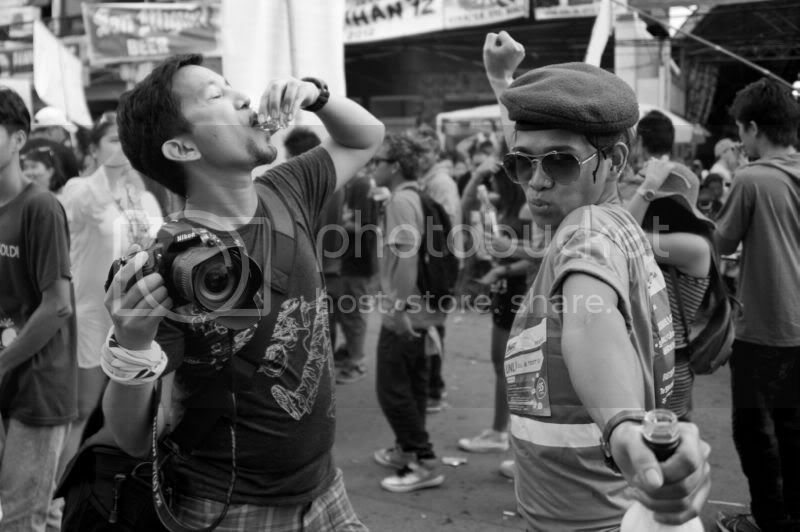 when sinulog in cebu or dinagyang in iloilo or masskara in bacolod imposes upon you the role of audience member, you stand on the pavement and watch as the festivals unfold, and leave the street dancing to the performing tribes. 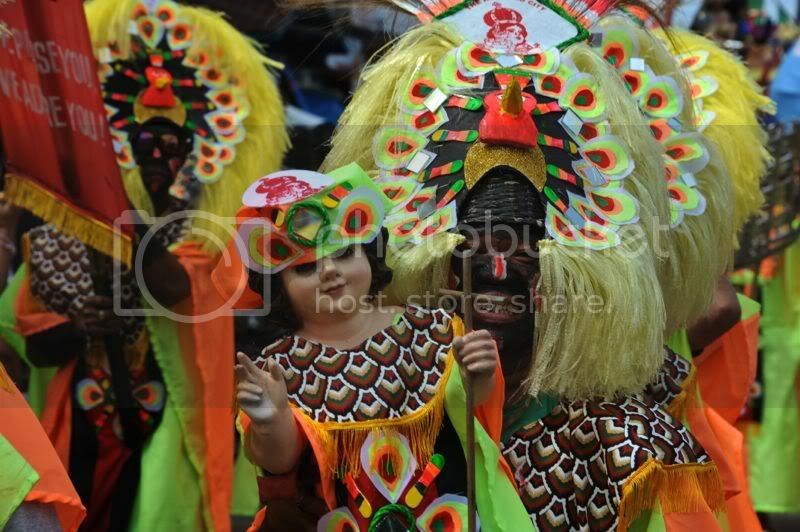 in ati-atihan's sadsad, you are part of the dancing, you are part of the festival. there are no barricades on the sidewalk to keep you from jumping into the slow-moving throng. there is no pressure to put up a dance number in front of an exacting judge as the only prize to be won here is the promise of having a jolly good time at so little a cost. there is only an open invitation to be yourself. and if that meant being crazy, then all the better. 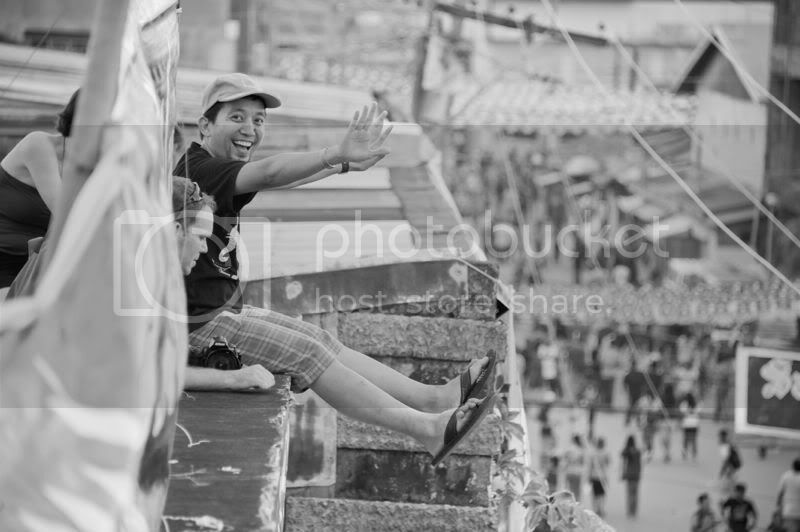 i returned to kalibo in the hope of being inconspicuous despite acting in a way that might otherwise attract attention. i achieved little in the way of being unnoticed. i don't exactly know what i had done the previous year here but many people remembered me: the french guy with the strangely-colored hair, the shy lady boy, teenagers who said i bought them a beer, strangers who shared my table on the sidewalk, the owner of the reggae bar, the fire dancers who appropriated my pictures on facebook. i have plausible deniability of the sordid details of those meetings. i can always attribute it to an overdose of red horse and those suspect liquids that got passed around on the streets. but these serendipitous encounters, however brief and momentary, painted my experience with deep unique hues. they reminded me of my fleeting freedom from conventions, when i took part in, and understood, the reason why we do the ati-atihan. i have to agree sir... being anonymous gives you the freedom you want. it separates you from the identities you have as declared by your work, your friends, your family or your organizations.